While the world may never know how many licks it takes to get to the center of a Tootsie Pop, sixth-grade math students at Lynn Camp Middle have an idea on the ratio and proportion of Skittles in a snack size bag. Students were excited and actively engaged as they were given their own bag of Skittles and worksheet that they completed independently. 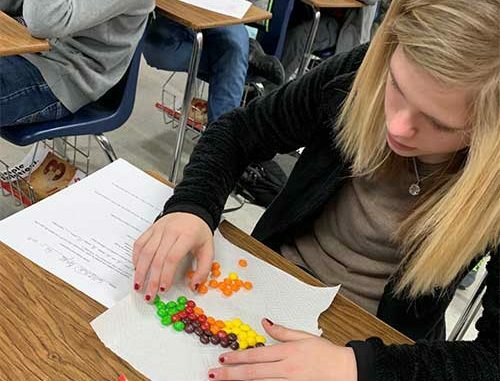 According to the student outcomes, candy was the trick to helping make a real-world connection to ratios and proportions (and finding out about how many of their favorite color of Skittles they could expect in a bag). “What better way to learn than with a yummy treat, we all love candy,” said Sizemore and the students agreed. This will be an activity that students will remember in the future as they continue to go more in-depth with critical math standards.